The steel market has experienced slow but steady year-over-year growth of 2-4% CAGR in recent years. Historically a high-volume and low margin business. At the same time, the commodity value of steel is diminishing. Global impact felt from China has forced slow-downs and underutilized capacity across the industry. A shift is underway, where differentiation through innovation is beginning, as steel manufacturers introduce lighter and higher strength materials that produce a higher quality product with a higher margin. A recent poll of metals executives, reported by Ernst & Young, indicates that mill productivity is declining, largely due to an inability for mills to integrate. And, the circular economy and sustainability is impacting the steel industry’s demand dynamics. To combat this, forward-leaning steel mills have placed a focus on improving productivity and margins from within. And this has spurred a movement around digital transformation that is being examined industry wide–the digital mill. The World Economic Forum predicts that, by 2025, digital transformation will create more than $425 billion of value for the metals industry as a whole. What’s Your Hidden Mill Worth? Over the next few months we will be rolling out a content series directed at helping steel manufactures understand ways to answer the question “what’s my hidden mill worth?”, meaning the opportunity cost associated with making improvements in efficiency, downtime, maintenance, and quality—all of which can impact the bottom line by leveraging digital technologies. For example, a major producer of large diameter pipes and railroad wheels was suffering with yearly increase in stock due to a lack of work planning. The plant maintenance (PM) solution they had in place was used for cost tracking only, which meant that their PM planning and budgeting was based on previous year’s cost history and the personal expertise of individuals. 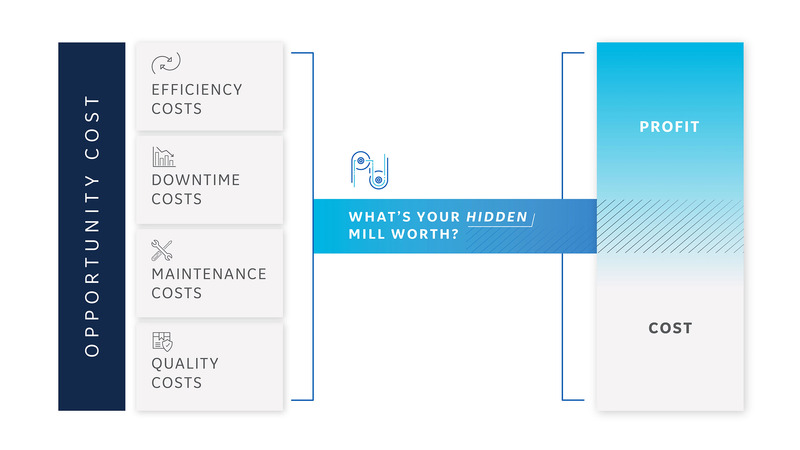 To unlock production efficiency and productivity, the mill partnered with GE Digital to combine their PM work history with new downtime tracking data captured in Predix Asset Performance Management (Predix APM) to reduce production bottlenecks, identify bad actors, and remedy them quickly. As a result, they achieved target availability of 91.25% and $1.1 million in maintenance cost reduction year over year. And, this is only one example. When it comes to enterprise visibility, steel manufactures have lagged behind other sectors. They’ve turned to employing point solutions, leaving them with disconnected data, people and processes]. By integrating data from a variety of systems, operators gain situational awareness that can reduce operational error and help troubleshoot processes to get to root causes more rapidly. Cost per ton is a critical measure for mills, that if improved can majorly impact mill profitability. A recent World Steel study shows that more than 90% of steel companies operate with excessive costs due reactive operations, maintenance and reliability cultures. In many cases this is due to people not having the right set of information and tools at hand to make better decisions in their day-to-day jobs. Whether that be to determine the root cause of a drop-in quality, trying to lower an organization’s percentage of unplanned downtime events, or determining where they should focus efforts to improve Overall Equipment Effectiveness (OEE)—the right digital technologies, with integrated work processes, can help steel manufactures break this reactive culture. The steel industry has a lot to gain with the adoption of digital mill technology. Its unique growth levers make the industry ripe for improvement and digital can help them solve their most urgent business problem: improving productivity and margin across the value chain. To learn more about how GE Digital can help you improve your mill productivity, visit our steel industry webpage. Jared Hartness is the Product Marketing Manager for the APM Integrity solution within GE’s Asset Performance Management suite of solutions. Prior to joining GE Digital, Hartness began his career with Meridium serving in a number of different capacities ranging from product marketing, marketing programs and digital marketing for their Asset Performance Management software solutions. He earned a Bachelor of Science Degree in Communication and Media Studies from Radford University. Learn how Predix APM increases asset reliability. How can we help you optimize your steel mill?